After writing a post about how much I hated beans — and after thoroughly hating beans for the past couple of weeks — yesterday, I found myself strangely at peace with them. Now don’t go thinking that I’ve gone all mushy and overly optimistic and glass-half-full-y. What I am about to describe is one half-hour of beanpicking only — and may not, under any circumstances, be extrapolated outwards to reflect an earth-shattering change in my typically cynical worldview. Emmett and I had just dropped the chicks off in the coop and headed down to the field to water the plants. While the drip-tape dripped and the misters misted, I found myself noticing some small, tender Kentucky Wonders tucked into the bean thicket amongst the gigantic podded-out monstrosities. Now please note: at no point did Emmett say “we really need to harvest beans today.” I, completely of my own accord, picked up a lug bin (aka harvest bin) and started tossing beans into it. And rather than focusing on all of the woody, podded-out beans — which were present in a three-to-one bad-to-good ratio — I focused on the nice, tender new ones. 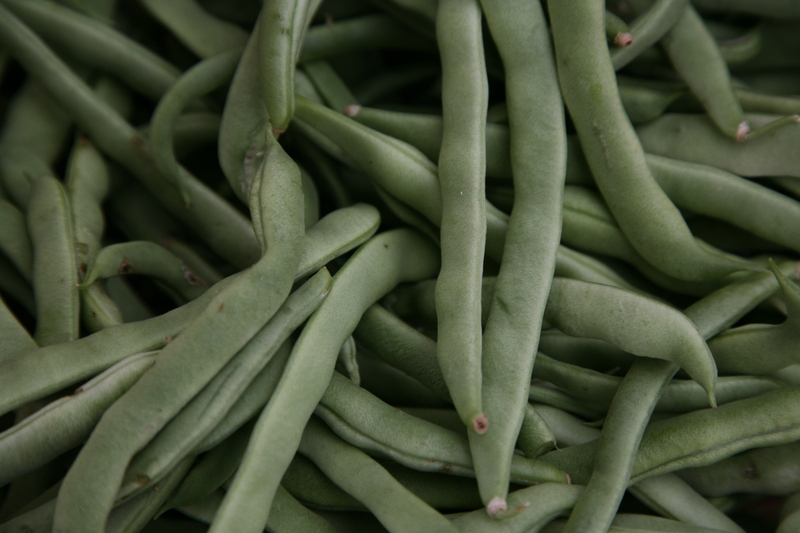 I left the large beans to nab later for soup beans, and let my fingers scour the vines in search of narrow beans to pinch and pick. And, having given the beans up for dead-and-done, I was amazed by the amount and quality of the second-wind crop. I didn’t really end up with very many beans — the purples, Kentucky Wonders, and Blue Lakes together just filled the bottom of the bin. But when you aren’t expecting much, a little is a lot. OK, that’s purty gosh darn lemons-into-lemonade-y. In fact, standing there picking beans, I must confess that I felt a little like Pollyana, Mary Englebreit, Hallmark, Ann Geddes and Precious Moments all rolled into one. So pardon my corny moment. This is not my normal M.O. But sometimes, just sometimes, it’s good to pay attention to the small, tender beans in the world, and not the irritatingly humongous ones.